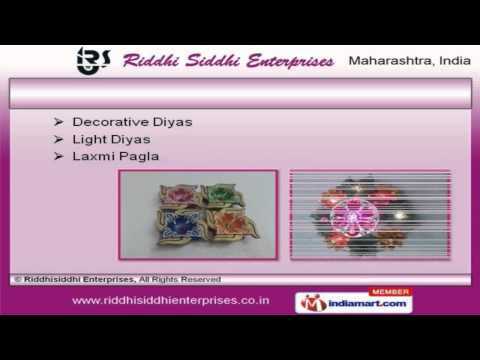 Welcome to Riddhisiddhi Enterprises, Manufacturer and Exporter of Earthen Diyas and Wooden Rangolis. The company was incorporated in 1998 at Mumbai. International quality standards and Good financial position make us different from others. Experienced RandD department and multiple payment options make us the first choice of our clients. We offer a wide array of Plastic Rangolis, Earthen and Floating Diyas. Our Folding, Wooden and Mirror Rangolis are best in the industry amongst others. We offer Laxmi Pagla, Decorative and Light Diyas that are in huge demand across the global markets. Shubh-Labh and Pooja Plates offered by us are some of our best selling products. Along with that we offer Ganesh Statues and Earthen Diyas for Homes that are a class apart. We also provide Plastic Rangoli for Offices that are nothing but the best solution for all your needs.